Every night it’s the same old, “What should we have for dinner?” It seems to come around so quickly that just as the dishes from the night before are being put away it’s time to do it all over again. And unlike making the bed or hanging up your coat, which I’ve all but given up on since you’re just going to mess it up or put it on again anyway, dinner is a necessity. And so, How To Eat Supper was particularly appealing. 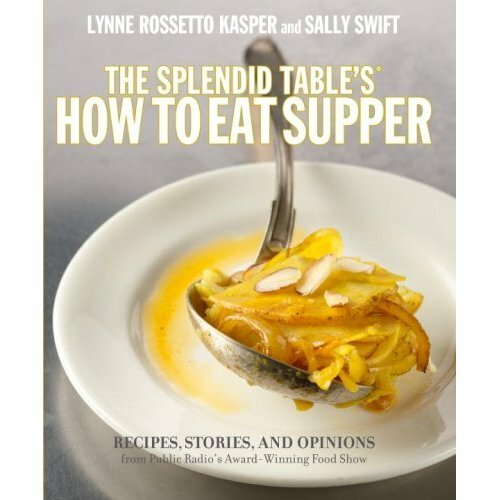 Not just for the recipes from my beloved Splendid Table host, Lynn Rossetto Kasper, but for the promise of a cooking philosophy or at least coping mechanisms to turn out interesting and tasty dinners weekday after weekday. It looks promising. I started reading it this evening and had to break for a snack to quell my growling stomach.